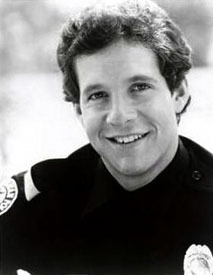 Steve Guttenberg is an actor whose career peaked early. He did his best work in Diner with Kevin Bacon and Daniel Stern, and later played Officer Carey Mahoney in the first four Police Academy movies. He also starred in Cocoon with Brian Dennehy and a cast of old all-stars, Short Circuit with Ally Sheedy, and Three Men and a Baby with Tom Selleck, Ted Danson. Guttenberg's career has been in an unending slump to oblivion since the sequel, Three Men and a Little Lady in 1990, after which he disappeared from movies for five years. He returned to the big screen with a supporting role in Jodie Foster's Home for the Holidays in 1995, but has appeared in nothing particularly noteworthy since. Some say he owes his entire career to the Stonecutters. In 1993, Guttenberg directed a CBS Schoolbreak Special, Love Off Limits, which dealt with the acceptance of homosexuality. In 2002, he wrote, directed, and starred in a film adaptation of James Kirkwood's 1970s classic of gay-straight friendship, P.S. Your Cat Is Dead. In 2004 Guttenberg starred in a Hallmark Channel holiday special, Single Santa Seeks Mrs. Claus. In 2005, he co-starred with Adam Baldwin in a Hallmark mini-series of The Poseidon Adventure.